A synod (/ˈsɪnəd/) is a council of a church, usually convened to decide an issue of doctrine, administration or application. The word synod comes from the Greek σύνοδος (sýnodos) meaning "assembly" or "meeting", and it is synonymous with the Latin word concilium meaning "council". Originally, synods were meetings of bishops, and the word is still used in that sense in Catholicism, Oriental Orthodoxy and Eastern Orthodoxy. In modern usage, the word often refers to the governing body of a particular church, whether its members are meeting or not. It is also sometimes used to refer to a church that is governed by a synod. Sometimes the phrase "general synod" or "general council" refers to an ecumenical council. The word synod also refers to the standing council of high-ranking bishops governing some of the autocephalous Eastern Orthodox churches. Similarly, the day-to-day governance of patriarchal and major archiepiscopal Eastern Catholic Churches is entrusted to a permanent synod. In Eastern Orthodox and Oriental Orthodox churches, synods of bishops are meetings of bishops within each autonomous Church and are the primary vehicle for the election of bishops and the establishment of inter-diocesan ecclesiastical laws. A sobor (Church Slavonic: съборъ, "assembly") is a formal gathering or council of bishops together with other clerical and lay delegates representing the church to deal with matters of faith, morality, rite, and canonical and cultural life. The synod in the Western churches is similar, but it is distinguished by being usually limited to an assembly of bishops. The term is found among those Eastern Orthodox Churches that use Slavic language (the Russian, Ukrainian, Bulgarian, Serbian and Macedonian Orthodox Churches), along with the Romanian Orthodox Church. The presence of clerical and lay delegates is for the purpose of discerning the consensus of the church on important matters; however, the bishops form an upper house of the sobor, and the laity cannot overrule their decisions. Kievan Rus' chronicles record the first known East Slavic church sobor as having taken place in Kiev in 1051. Sobors were convened periodically from then on; one notable assembly held in 1415 formed a separate metropoly for the church in the Grand Duchy of Lithuanian lands. A bishop may also call a sobor for his diocese, which again would have delegates from the clergy, monasteries and parishes of his diocese, to discuss important matters. Such diocesan sobors may be held annually or only occasionally. In Roman Catholic usage, synod and council are theoretically synonymous as they are of Greek and Latin origins, respectively, both meaning an authoritative meeting of bishops for the purpose of church administration in the areas of teaching (faith and morals) or governance (church discipline or law). However, in modern use, synod and council are applied to specific categories of such meetings and so do not really overlap. A synod generally meets every three years and is thus designated an "Ordinary General Assembly." However, "Extraordinary" synods can be called to deal with specific situations. There are also "Special" synods for the Church in a specific geographic area such as the one held November 16-December 12, 1997, for the Church in America. While the words "synod" and "council" usually refer to a transitory meeting, the term "Synod of Bishops" or "Synod of the Bishops", is also applied to a permanent body established in 1965 as an advisory body of the pope. It holds assemblies at which bishops and religious superiors, elected by bishops conferences or the Union of Superiors General or appointed by the Pope vote on proposals ("propositiones") to present for the pope's consideration, and which in practice the pope uses as the basis of "post-synodal apostolic exhortations" on the themes discussed. While an assembly of the Synod of Bishops thus expresses its collective wishes, it does not issue decrees, unless in certain cases the pope authorizes it to do so, and even then an assembly's decision requires ratification by the pope. The pope serves as president of an assembly or appoints the president, determines the agenda, and summons, suspends, and dissolves the assembly. An ecumenical council is an irregular meeting of the entire episcopate in communion with the pope and is, along with the pope, the highest legislative authority of the universal Church (can. 336). The pope alone has the right to convoke, suspend, and dissolve an ecumenical council; he also presides over it or chooses someone else to do so and determines the agenda (can. 338). The vacancy of the Holy See automatically suspends an ecumenical council. Laws or teachings issued by an ecumenical council require the confirmation of the pope, who alone has the right to promulgate them (can. 341). The role of the pope in an ecumenical council is a distinct feature of the Catholic Church. Plenary councils, which are meetings of the entire episcopate of a nation (including a nation that is only one ecclesiastical province), are convoked by the national episcopal conference. Provincial councils, which consist of the bishops of an ecclesiastical province smaller than a nation, are convoked by the metropolitan with consent of a majority of the suffragan bishops. Plenary and provincial councils are categorized as particular councils. A particular council is composed of all the bishops of the territory (including coadjutors and auxiliaries) as well as other ecclesiastical ordinaries who head particular churches in the territory (such as territorial abbots and vicars apostolic). Each of these members has a vote on council legislation. Additionally, the following persons by law are part of particular councils but only participate in an advisory capacity: vicars general and episcopal, presidents of Catholic universities, deans of Catholic departments of theology and canon law, some major superiors elected by all the major superiors in the territory, some rectors of seminaries elected by the rectors of seminaries in the territory, and two members from each cathedral chapter, presbyterial council, or pastoral council in the territory (can. 443). The convoking authority can also select other members of the faithful (including the laity) to participate in the council in an advisory capacity. Meetings of the entire episcopate of a supra-national region have historically been called councils as well, such as the various Councils of Carthage in which all the bishops of North Africa were to attend. During the Middle Ages, some councils were legatine, called by a papal legate rather than the pope or bishop. National Episcopal Conferences are another development of the Second Vatican Council. They are permanent bodies consisting of all the Latin rite bishops of a nation and those equivalent to diocesan bishops in law (i.e. territorial abbots). Bishops of other sui juris churches and papal nuncios are not members of episcopal conferences by law, though the conference itself may invite them in an advisory or voting capacity (can. 450). While councils (can. 445) and diocesan synods (can. 391 & 466) have full legislative powers in their areas of competence, national episcopal conferences may only issue supplementary legislation when authorized to do so in canon law or by decree of the Holy See. Additionally, any such supplemental legislation requires a two-thirds vote of the conference and review by the Holy See (can. 455) to have the force of law. Without such authorization and review, episcopal conferences are deliberative only and exercise no authority over their member bishops or dioceses. In the Anglican Communion, synods are elected by clergy and laity. In most Anglican churches, there is a geographical hierarchy of synods, with General Synod at the top; bishops, clergy and laity meet as "houses" within the synod. 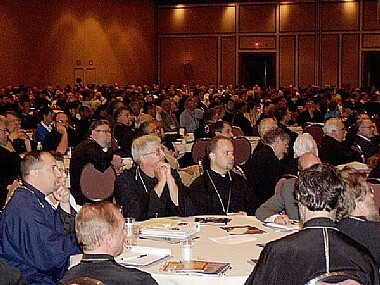 Diocesan synods are convened by a bishop in his or her diocese, and consist of elected clergy and lay members. Deanery synods are convened by the Rural Dean (or Area Dean) and consist of all clergy licensed to a benefice within the deanery, plus elected lay members. In Lutheran traditions a synod can be a legislative body at various levels of the church administration. It can also refer to an administrative region or an entire church body. Lutheran synods of the 1500s were only clergy gatherings such as those in the pre-Reformation church. Synods were held annually and dealt with only spiritual matters. The inclusion of the laity in gatherings termed "synod" began with the Reformed churches and spread to the Lutherans. In the 1600s, Reformed-style synodical governance was adopted by the Lutheran congregations in the United Duchies of Jülich-Cleves-Berg when the sovereigns ceased to play a hand in church matters. A combination of consistorial and presbyterial-synodal style governance was instituted in the Prussian Union of Churches under Frederick William III of Prussia. Lutherans who immigrated from Germany and Scandinavia also adopted this form of synod, because the lands they immigrated to had no state church. The specific design of the synods took guidance from philosophies of organizational governance used at the time such as those modeled after the influence of Kant and Hegel. When the German monarchy and the sovereign governance of the church was ended in 1918, the synods took over the governance of the state churches. In North America, a synod can be a local administrative region similar to a diocese in other denominations. An example of this is the Minneapolis Area Synod of the Evangelical Lutheran Church in America. However, for some denominations such as the Lutheran Church–Missouri Synod and the Wisconsin Evangelical Lutheran Synod, it denotes an entire church body. The usage of synod as an administrative ecclesiastical region is also reflected by the German term Synodalverband (i.e. synodal federation), such as the Regional Synodal Federation of the Free City of Danzig. In Europe, a synod can be a legislature comprising deputies elected by all enfranchised members of a church and competent for the entire church. It is similar to a general assembly in Presbyterianism, and found, in regional Protestant church bodies (Landeskirche) in Germany; examples include Landessynode (i.e. regional or land synod) or Generalsynode (general synod). A synod can also be used by an administrative subunit of a church body, such as a city synod (Stadtsynode; comprising synodal deputies of congregations of one denomination within one city) or provincial synod (Provinzialsynode; comprising synodal deputies of congregations within an ecclesiastical province). The use of the term synod to describe a small gathering is now obsolete, the term used instead is Kirchenkreis. A few Lutheran churches, such as the Church of Sweden or the Evangelical Regional Church in Württemberg, allow for the formation of political parties (also known as nominating groups, church party or colloquy circle) to nominate candidates for the Synod as a legislation; it is an extension of the idea of multi-ideological democracy within the church. The Missouri Synod also has nominating groups, but they are not officially recognized by the Synod and are not closely linked to any secular political parties as in Sweden. Larger nominating groups include Jesus First/Congregations Matter and the United List. Also the former Evangelical Church of the Prussian Union, comprising mostly Lutheran but also some Reformed and United Protestant congregations, had church parties in its presbyterial and synodal elections. In the Presbyterian system of church governance the synod is a level of administration between the local presbytery and the national general assembly. Some denominations use the synod, such as the Presbyterian Church in Canada, Uniting Church in Australia, and the Presbyterian Church USA. However some other churches do not use the synod at all, and the Church of Scotland dissolved its synods in 1993, see List of Church of Scotland synods and presbyteries. In Swiss and southern German Reformed churches, where the Reformed churches are organized as regionally defined independent churches (such as Evangelical Reformed Church of Zurich or Reformed Church of Berne), the synod corresponds to the general assembly of Presbyterian churches. In Reformed churches, the synod can denote a regional meeting of representatives of various classes (regional synod), or the general denominational meeting of representatives from the regional synods (general or national synod). Some churches, especially the smaller denominations, do not have the regional synod tier (for example, the Reformed Church in the United States (RCUS)). Historically, these were meetings such as the Synod of Homberg. In the Democratic Republic of the Congo, the vast majority of Protestant denominations have regrouped under a religious institution named the Church of Christ in Congo or CCC, often referred to – within the Congo – simply as The Protestant Church. In the CCC structure, the national synod is the general assembly of the various churches that constitutes the CCC. From the Synod is drawn an Executive Committee, and a secretariat. There are also synods of the CCC in every province of the Congo, known appropriately as provincial synods. The CCC regroups 62 Protestant denominations. The Canons of the first four general councils of Nicaea, Constantinople, Ephesus and Chalcedon (in Ancient Greek). Oxford: Clarendon Press. 1880. Benson (1893). The six œcumenical councils of the undivided catholic church: Lectures delivered in 1893 under the auspices of the church club of New York. New York: E. & J.B. Young. Dubose, William Porcher (1896). The ecumenical councils. New York: Christian Literature Co.
Percival, Henry Robert (1900). Schaff, P.; Wace, H. (eds.). The Seven Ecumenical Councils of the Undivided Church: Their Canons and Dogmatic Decrees, Together with the Canons of All the Local Synods which Have Received Ecumenical Acceptance. Nicene and post-Nicene Fathers of the Christian Church. Parker. Schroeder, Henry Joseph (1937). Disciplinary decrees of the general councils: Text, translation, and commentary. St. Louis, MO: B. Herder Book Co.
Alberigo, Giuseppe; Ioannou, Periclīs-Petros; Leonardi, Claudio; Jedin, Hubert (1962). Conciliorum Oecumenicorum Decreta. Basilae: Herder. Alberigo, Giuseppe; Dossetti, Joseph A; Jedin, Hubert (1973). Conciliorum Oecumenicorum Decreta. Bologna: Bologna Institute for Religious Sciences. Tanner, Norman P. (1990). Decrees of the ecumenical councils. 2 Volumes. Sheed & Ward ; Georgetown University Press. ISBN 978-0-87840-490-2. Alberigo, Giuseppe; Melloni, Alberto, eds. (2000–2017). Conciliorum Oecumenicorum Generaliumque Decreta: Editio critica. Corpus Christianorum. 4 Volumes. Turnhout: Brepols Publishers. ^ In English "Synod of Bishops" is the usual expression for what in other languages is usually called the "Synod of the Bishops": "eo:Sinodo de la Episkopoj", "es:Sínodo de los obispos", "fr:Synode des évêques", "it:Sinodo dei vescovi"
^ a b See "Acta conciliorum oecumenicorum" (webpage). Wisconsin Lutheran College. Retrieved 17 August 2017. The Councils of Carthage were church synods held during the 3rd, 4th, and 5th centuries in the city of Carthage in Africa. The most important of these are described below. The Evangelical Lutheran Church in America (ELCA) is a mainline Protestant Lutheran Church headquartered in Chicago, Illinois. The ELCA officially came into existence on January 1, 1988, by the merging of three Lutheran church bodies. As of 2017, it has approximately 3.5 million baptized members in 9,163 congregations. In 2015, Pew Research estimated that 1.4 percent of the U.S. population self-identifies with the ELCA. It is the seventh-largest Christian denomination by reported membership and the largest Lutheran denomination in the United States. The next two largest Lutheran denominations are the Lutheran Church–Missouri Synod (LCMS) (with approximately 2.0 million members) and the Wisconsin Evangelical Lutheran Synod (WELS) (with approximately 360,000 members). There are also many smaller Lutheran church bodies in the United States, some of which came into being composed of dissidents following the major 1988 merger. The ELCA belongs to the World Council of Churches and the Lutheran World Federation. The ELCA is in full communion with the Episcopal Church, Moravian Church, Presbyterian Church (USA), Reformed Church in America, United Church of Christ, and the United Methodist Church. The Evangelical Lutheran Synod (ELS) is a US-based Protestant Christian denomination based in Mankato, Minnesota. It describes itself as a conservative, Confessional Lutheran body. The ELS is in fellowship with the Wisconsin Evangelical Lutheran Synod (WELS) and is a member of the international Confessional Evangelical Lutheran Conference (CELC). The General Synod is the deliberative and legislative body of the Church of England. The synod was instituted in 1970, replacing the Church Assembly, and is the culmination of a process of rediscovering self-government for the Church of England that had started in the 1850s. As of July 2010, there were 124 Measures passed and unrepealed. In the Roman Catholic Church, the Synod of Bishops is an advisory body for the Pope. It is described in the Code of Canon Law (CIC) as "a group of bishops who have been chosen from different regions of the world and meet together at fixed times to foster closer unity between the Roman Pontiff and bishops, to assist the Roman Pontiff with their counsel in the preservation and growth of faith and morals and in the observance and strengthening of ecclesiastical discipline, and to consider questions pertaining to the activity of the Church in the world. "The Synod of Bishops is permanent, even when not in session. Periodically, it holds assemblies, which are either general, if called to consider matters directly concerning the universal Church, or special, if called for problems of a particular geographical area. The general assemblies are either ordinary (held at fixed intervals) or extraordinary (held to treat of some urgent matter).The Synod of Bishops also has a permanent secretariat headquartered in Rome but is not part of the Roman Curia. Pope Francis greatly increased both the authority and influence of the Synod in September 2018. The Synod of Diamper, held at Udayamperoor (called Diamper in non-vernacular sources), was a diocesan synod or council that laid down rules and regulations for the ancient Saint Thomas Christians of the Malabar Coast (modern Kerala state, India), formally uniting them with the Catholic Church. This led to the creation of the Eastern Catholic Syro-Malabar Church, which follows a Latinized East Syriac Rite liturgy.It was convened on 20 June 1599, under the leadership of Aleixo de Menezes, Latin rite Archbishop of Goa. Archdeacon George of the Cross was forced to comply with the wishes of the Archbishop of Goa. This separated the Saint Thomas Christians from the Church of the East in Persia and subjected them directly to the Latin Archbishopric of Goa. The Archbishopric of Angamaly was downgraded to a bishopric under Goa in 1600 AD. Portuguese Padroado rule was thus imposed and the bishops for Saint Thomas Christians were appointed by Portuguese Padroado. The Synod of Jassy (also referred to as the Council of Jassy) was convened in Iași (Jassy), Moldavia (present day Romania), between 15 September - 27 October 1642, by the Ecumenical Patriarch Parthenius I of Constantinople, with the support of the Moldavian Prince Vasile Lupu.The purpose of the synod was to counter certain Roman Catholic and Protestant "doctrinal errors" which had made inroads into Orthodox Christian theology and to offer a comprehensive Orthodox statement on the content and character of the faith. Including representatives of the Greek and Slavic Churches, it condemned the Calvinist teachings ascribed to Cyril Lucaris and ratified (a somewhat amended text of) Peter Mogila's Expositio fidei (Statement of Faith, also known as the Orthodox Confession), a description of Christian orthodoxy in a question and answer format. The Statement of Faith became fundamental for establishing the Orthodox world's attitude toward Reformation thought. The major contribution of the synod was the reinforced sense of unity in the Orthodox Church through the promulgation of an authoritative statement agreed upon by all the major sees. The Wisconsin Evangelical Lutheran Synod (WELS), also referred to simply as the Wisconsin Synod, is an American Confessional Lutheran denomination of Christianity. Characterized as theologically conservative, it was founded in 1850 in Milwaukee, Wisconsin. As of 2018, it had a baptized membership of 359,426 in 1,281 congregations, with churches in 47 US states and 4 provinces of Canada. It is the third largest Lutheran denomination in the United States. The WELS school system is the fourth largest private school system in the United States.The WELS is in fellowship with the Evangelical Lutheran Synod (ELS) and is a member of the Confessional Evangelical Lutheran Conference (CELC), a worldwide organization of Lutheran church bodies of the same beliefs.